The Super Eagles had a debut World Cup to remember with scintillating performances and breathe taking goals to go with it. It culminated in the team being voted the second most entertaining team in the tournament and an all-time high of number 5 in the FIFA ranking following the World Cup. The Eagles scored 7 goals in that tournament, an opening 3-0 win against Bulgaria, one in the 2-1 defeat to a Diego Maradona led Argentina. A 2-0 win against Greece in the last group game saw the Eagles qualify for the round of 16 as group winners before being knocked out of the tournament with a 2-1 defeat to eventual finalist Italy. In France 1998 the Eagles scored six goals, three in the opening game, a surprising 3-2 win over then European under achievers, Spain, one each in a 1-0 win over Bulgaria, a 3-1 loss to Paraguay and a 4-1 bashing in the hands of Denmark. A solitary goal was scored in Korea/Japan 2010 in a 2-1 defeat to Sweden while the team failed to score in the 1-0 loss to Argentina and a goalless draw with England. 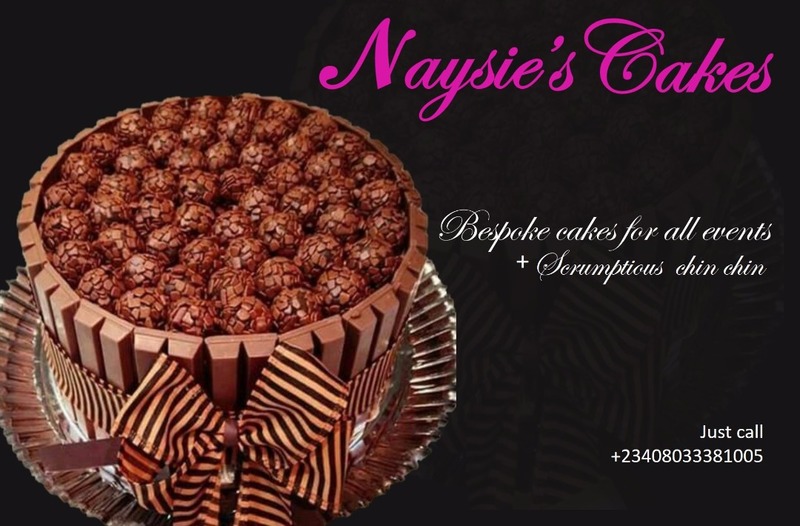 In South Africa 2010, Nigeria found the back of the net 3 times. Once in a shocking 2-1 defeat to Greece and twice in a 2-2 draw with Korea Republic, with the team failing to score in the 1-0 loss to Argentina. With the Samba nation as host of the last World Cup in 2014 the Eagles were not so lucky in front of goal scoring, 3 times in four games. A single goal was scored in the 1-0 win over Bosnia & Herzegovina and two goals scored in the 3-2 defeat to Argentina, they failed to score in a 0-0 draw with Iran and a 2-0 loss to France. The Eagles were cautioned nine times in her debut outing at the World Cup and eight in her second outing in France 98 and twice in her third outing in Korea/Japan 2002. During the period in view, Augustine Eguavoen, Michael Emenalo, Sunday Oliseh, Mutiu Adepouju, Uche Okechukwu and Austin Okocha were cautioned twice. While Emmanuel Amuneke, Stephen Keshi, Chidi Nwanu, Victor Ikpeba, Efe Sodje, Benedict Iroha and Taribo West went into the referee’s book once. The Eagles have gotten to the second round of the World Cup three times, the debut in USA 1994, France 1998 and in Brazil 2014 which means the Eagles played four games in each of these tournaments, 3 in the first round and a round of 16 clash. While first round exits in 2002 when the World Cup was co-hosted by Korea and Japan; and in South Africa 2010 means the Eagles only get to play three games. Femi Opabunmi was 17 years, 3 months and nine days when he played for the Super Eagles against the Three Lions of England at the World Cup co-hosted by Korea and Japan in 2002. Opabunmi benefited from a massive clear out in the national team after their disappointing 3rd place finish at the AFCON in Mali earlier in the year. The previous year Opabunmi was part of the National Under 17 team that reached the final of the FIFA Under 17 World Cup in France. English clubs have supplied 16 players for the Eagles in 5 World Cup appearances. Efan Ekoku of Norwich City was the only England based player in USA 94, while Chelsea’s Celestine Babayaro made the team in 1998. Nwankwo Kanu of Arsenal, Efe Sodje of Crewe Alexander and Celestine Babayaro still in the books of Chelsea made it in Korea/Japan 2002. Everton supplied Yakubu Aiyegbeni and Joseph Yobo in 2010, Portsmouth had John Utaka and Kanu Nwankwo in their books while Dickson Etuhu of Fulham and Bolton Wanderers Daniel Shittu completed the English party in 2010. Mikel Obi, Victor Moses and Kenneth Omeruo were all owned by Chelsea in 2014, Shola Ameobi of Newscastle and Osaze Odenwengie of Stoke City completes the list. 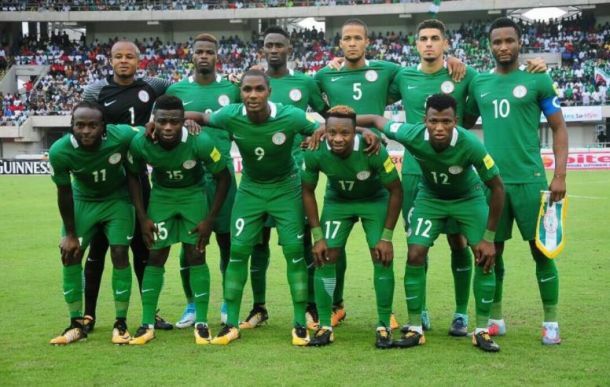 Fifteen players have accounted for Nigeria’s twenty goals scored at the World Cup in the five editions the Super Eagles have attended. Five players were responsible for the seven goals scored in USA 94. Former African player of the year Emmanuel Amunuke and Daniel Amokachi scored two goals each while Finidi George, late Rashidi Yekini and Samson Siasia scored a goal each. Amokachi’s strikes came in the 3-0 win over Bulgaria and the 2-0 win against Greece, Amuneke also scored in the 3-0 win over Bulgaria and he scored the only goal in the round of 16 clash, a 2-1 loss to Italy. George Finidi scored the first goal against Greece, a delightful chip and an equally amazing celebration- going down on all fours, crawling a few yards before lifting his right leg like a dog about to take a leak. 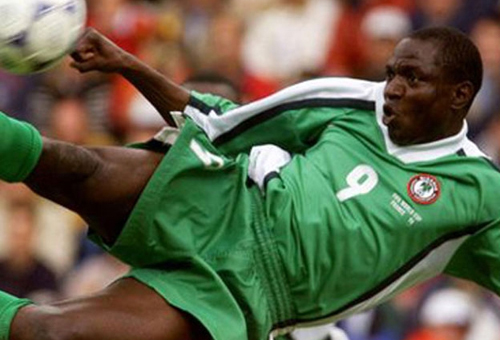 Rashidi Yekini scored our first ever world cup goal against Bulgaria while Siasia scored in the 2-1 loss to Argentina. In France 98 five players scored six goals. 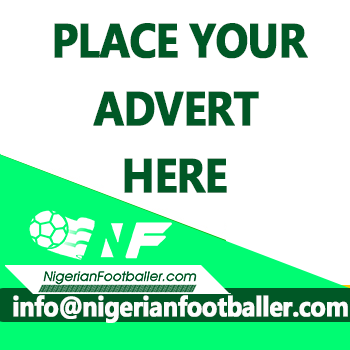 Mutui Adepouju and Sunday Oliseh in the first game against Spain, Victor Ikpeba against Bulgaria, Wilson Oruma against Paraguay and Tijani Babangida against Denmark. Garba Lawal’s strike against Spain was recorded as an own goal for Spanish goalkeeper Andoni Zubizerreta. Juluis Aghahowa scored the only goal in Korea/Japan 2002 in the 2-1 loss to Sweden, while the three goals in South Africa 2010 were scored by Kalu Uche (2 goals – Greece and Korea) and Yakubu Aiyegbeni’s penalty goal against Korea after he had missed an open goal from 3 yards, a miss Nigerians will never forget. Ahmed Musa’s brace against Argentina in Brazil 2014 and Osaze Odenwingie’s goal in the 1-0 win over Bosnia and Hezergovina rounds off the goals Nigeria has scored at the World Cup. Out of the 26 goals Eagles have conceded at the World Cup, 14 were against European oppositions. Italy scored twice against the Eagles in the second round match in USA 94 while in France 98, Spain and Denmark were responsible for 6 goals scored against the Eagles, Spain scoring twice and Denmark 4 in the 4-1 second round white wash. In 2002, Sweden scored 2 goals against the Super Eagles and Greece also scored twice against the Eagles in 2010 in South Africa. At the last World Cup in Brazil, France beat the Eagles 2-0 in the round of 16 the only goals conceded to a European team by Nigeria in the tournament. Argentina had 13 shots on target against Nigeria in Brazil 2014, beating Vincent Enyeama 3 times. Lionel Messi scored a brace while Marcos Rojo scored the other. Coaches have been appointed twelve times to successfully navigate Nigeria to the World Cup and at the World Cup proper. The first on this list is Clemens Westerhof, the Dutch man who against all odds successful qualified Nigeria for her first World Cup in USA 1994 and unlike some of his successors also coached the Eagles at the Mundial. The qualification campaign for the 1998 World Cup in France was handled by two coaches. Shaibu Amodu was in charge for the first two games against Guinea and Kenya before French man Phillippe Troussier took over for the remaining qualifiers. Troussier lost his place on the Super Eagles bench to “World Class Coach” Bora Mulitinovic who took Nigeria to the Mundial in France. Amodu would suffer the same fate enroute Korea/Japan 2002 losing his job to Adegboye Onigbinde after qualifying the Eagles for the World Cup. Amodu had rescued the Eagles World Cup campaign from Dutch man Jo Bonfrere after an abysmal start. Shaibu Amodu yet again was given the task to qualify the Super Eagles for the first World Cup on African soil slated for South Africa in 2010. Nigeria had missed out on qualification in Germany 2006. Amodu succeeded yet again despite a topsy-turvy campaign, but for a second time he was deemed not good enough to lead our charges at the World Cup and in came the Swede - Lars Lagerback. Stephen Keshi steered the qualification for Brazil 2014 and led the team to the Mundial. While in the qualification for Russia 2018, Sunday Oliseh began the race but relinquished his position to Germany’s Gernot Rohr who qualified Nigeria for the World Cup and Rohr is finely poised to lead Nigeria at the fiesta. At the fifteenth edition of the World Cup the Nigerian flag was hosted for the very first time and 11 gladiators had the honour of being the first to don the green and white jersey at the Mundial. Peter Rufai the skipper of the day was in goal while the defense was marshalled by the ‘gentle giant’ Uche Okechukwu supported by Chidi Nwanu, Benedict Iroha and Augustine Eguavoen. The midfield had Sunday Oliseh, Samson Siasia, Emmanuel Amuneke and Finidi George, with Rashidi Yekini and Daniel Amokachi as the strikers. Nigeria have taken ten goalkeepers to the World Cup with only three tasting action-Peter Rufai, Ike Shorunmu and Vincent Enyeama. Rufai was in goal at the 1994 and 1998 World Cups, Shorunmu was at the 2002 World Cup and kept in games against Argentina and Greece while Enyeama was in action in 2002 against England and made it to the 2010 and 2014 World Cups as first choice. Alloy Agu and Wilfred Agbonavbare were backup goalkeepers in 1994 while Abiodun Baruwa and Willy Opara deputized for Rufai in 1998. Austin Ejide made it to the 2002, 2010 and 2014 World Cups whereas Dele Aiyenugba and Chigozie Agbim made the squad in 2010 and 2014 respectively. Super Eagles players were cautioned 9 times at her debut appearance in USA 94. Emmanuel Amuneke was the first Eagles player to go into the referee’s book for Nigeria at the World Cup in the game against Bulgaria. Michael Emenalo and Augustine Eguavoen saw yellow in the game against Argentina, while Stephen Keshi and Sunday Oliseh were booked against Greece. In the second Round tie against Italy, Chidi Nwanu, Sunday Oliseh, Michael Emenalo and Mutiu Adepouju were cautioned. Eight substitutions was made by Nigeria at her debut World Cup in USA 1994. Samson Siasia was the first player to be substituted against Bulgaria when he left the field for head master Mutiu Adepoju in the 66th minute. Finidi George followed as Emeka Ezeugo took his place. A similar substitution was made in game 2 (Mutiu for Siasia), while Austin ‘Jay Jay’ Okocha replaced Sunday Oliseh. 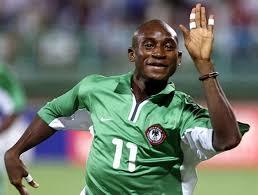 Against Greece, Jay Jay replaced Rashidi Yekini whereas Mutiu came on for Finidi George. The Eagles had two forced substitution in the Second Round encounter against Italy due to injuries. Mutiu Adepouju came in for Daniel Amokachi in the 35th minute while Thompson Oliha replaced Emmanuel Amuneke in the 57th minute. Nigeria has played Argentina four times at the World Cup, losing all, conceding 7 goals and scoring just 3. A 2-1 loss in USA was followed by two 1-0 losses in Korea/ Japan 2002 and South Africa 2010. The last meeting was a 3-2 loss in Brazil 2014. Six home based players have made it to the World Cup for Nigeria. But it was until the 2002 edition co-hosted by Korea and Japan that the home based first made it to the Mundial. Goal keepers Vincent Enyeama of Enyimba FC and Austin Ejide of Gabros International FC; and Femi Opabunmi of Shooting Stars were the first home based players at the World Cup. The Eagles have won just 5 games at the World Cup, all of them against European opposition. Bulgaria and Greece were taken to the cleaners in USA 94, Spain and Bulgaria tasted the humble pie in France 98, while Bosnia and Herzegovina lost to the Eagles in Brazil 2014. It took Ahmed Musa just 4 minutes to get on the score sheet for Nigeria against Argentina in response to Lionel Messi’s 3rd minute opener in the final group game in Brazil 2014. The Eagles have drawn three games at the World Cup. A goalless draw against the three lions of England in 2002, a 2-2 draw against Korea Republic in 2010 and a goalless draw against Iran in the first group game of Brazil 2014. 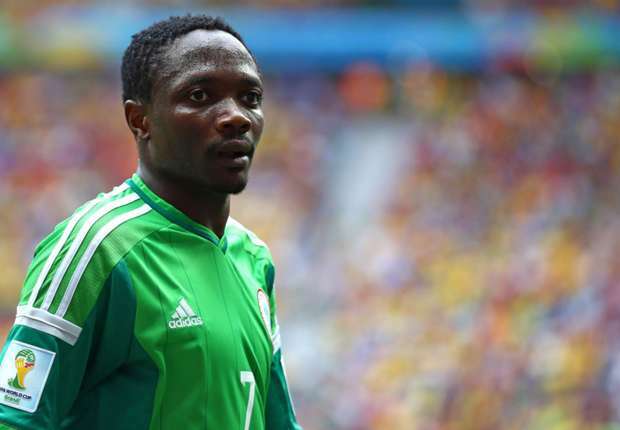 Ahmed Musa scored a brace against Argentina in the last group game at the World Cup in Brazil 2014. The Super Eagles eventually lost the game 3-2. Sani Kieta received the marching orders against Greece at the World Cup in South Africa 2010 for a needless Kung-fu kick on a Greek player with the Eagles leading 1-0. The Eagles eventually lost 2-1 and Kaita never played for Nigeria again.